If you have been a long-time Linux user, you probably are using your favorite distro, or a desktop environment that can improve your productivity. But what if you are planning to switch from Windows to Linux and you are not sure of which distro to use? To make thing worse, you do some research and find that there are a ton of desktop environments out there and each distro comes with more desktop environments. So, which one should you choose? That is really a hard to solve problem, and that is where Hybryde Fusion comes into play. It is basically a distro that comes pre-installed with eleven different desktop environments so you can test out each and every one of them and see which one you like. Hybryde Fusion is great for testing and is not meant for live production use. 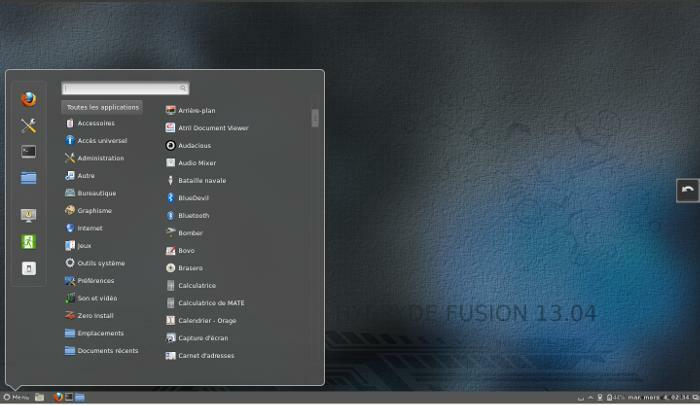 To get started, head over to the Hybryde site and download the Hydryde Fusion distro. It is quite large (1.6GB) so leave aside some time for the download. Personally, I tested the distro in a virtual machine (with Virtualbox) and all the desktop environments work fine. I would recommend you to do the same to save you the trouble of creating a live CD (USB). This is what you will see once it is booted to the desktop. 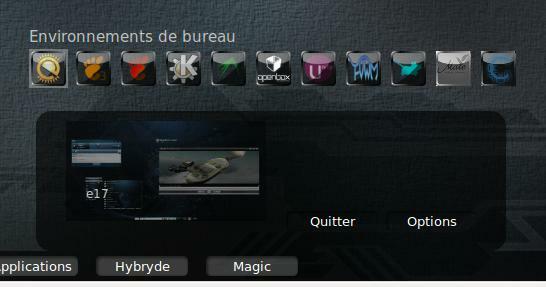 The whole distro is in French with a little mix of English. Don’t be too bothered by that, as it doesn’t really interfere with the testing. Move your cursor to the bottom menu and click the “Hybryde” button. 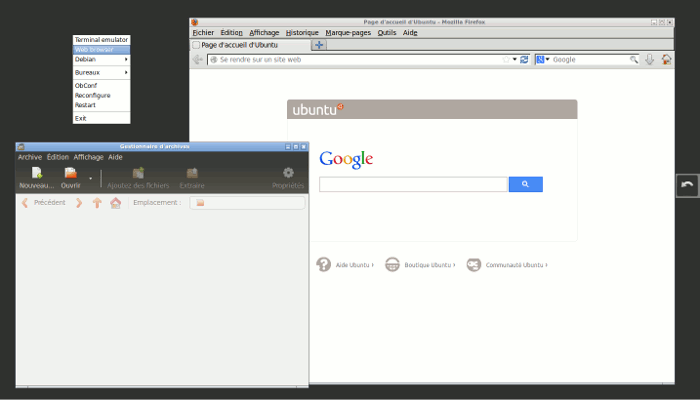 You can now see a list of desktop environments that you can run. As you scroll through each DE, it shows a screenshot preview of the DE so you have a rough idea of what each DE looks like. To try Enlightenment (E17), simply click the E17 icon in the DE list. The Enlightenment desktop environment will immediately load. Enlightenment is one of our favorite desktop environments, so it is great to see it included here. In case you are lost in Enlightenment’s user interface, you can click anywhere on the desktop to access the menu. Once you are done testing this DE, click the “Back” arrow button on the right side of the desktop to return to the main Hybryde desktop. 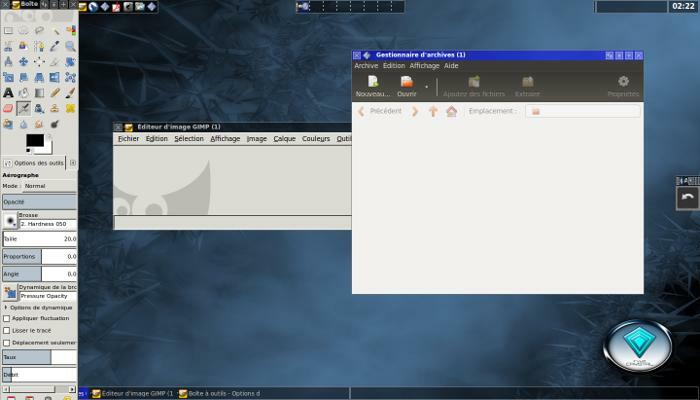 Here are screenshots of some of the desktop environments. You probably won’t need Hybryde Fusion if you are familiar with the various desktop environments. 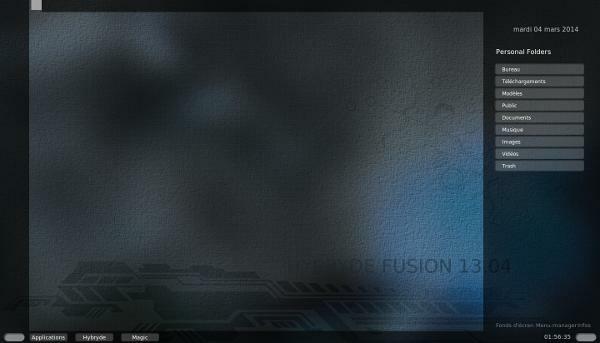 However, for those who want to try out each individual desktop environment and see if it is better than the one you are using without installing a whole bunch of desktop packages in your system, Hybryde Fusion will be great for you. One thing, though: Hybryde Fusion is not suitable for live production use. Running it on your virtual machine is fine, but don’t install it in your computer. The problem with Hybryde is that the most current version is over 18 months old. 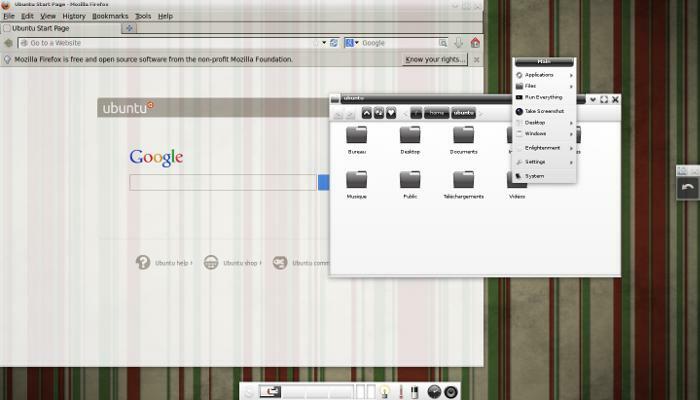 During that time quite a few changes and improvements have been made to the kernel and many of the desktops. While the functionality and the purpose of Hybryde is not changed, it is not as up-to-date as other distros. Even Debian, which usually is the last to implement upgrades, is more current than Hybryde. have not changed much for the past 18 months. We actaully do not know what version of each desktop is included in Hybryde. The distro itself is 18 months old. The DEs could be 24 months old or older. If an early KDE4.x is the one that is used in Hybryde, it will not leave a favorable impression on the user. BTW – When I try to access the Hybryde site, www.hybryde.org, for any more information, I get a “Domain not found” error. That would indicate to me that the distro has disappeared from the Linux landscape. If the distro release is 18 months old the DEs could be much older and in that case there could be significant changes. Be that as it may, the question may be moot. When I try to access the Hybryde site www.hybryde.org, I get a “domain not found” error. Seems like the distro has gone to that bit bucket in the sky. LinuxBBQ offers 76 different desktops. The latest version of Hybryde is now over 2 years old which in the Linux world is like forever. It is older even then the latest Debian Stable which everyone ridicules for being out of date.